WOODINVILLE, Wash.--(BUSINESS WIRE)--MOGA™ is charging into the holiday season with two new world-class controllers for mobile gamers—MOGA HERO POWER and MOGA PRO POWER. Both the slim, portable MOGA HERO POWER and the full-sized MOGA PRO POWER bring something never before seen in a mobile game controller, MOGA Boost™ Technology. MOGA Boost charges the user’s phone while they play, allowing for longer game sessions without concern for running down their phone's battery. The MOGA HERO POWER ($59.99 MSRP) and MOGA PRO POWER ($79.99 MSRP) for Android 2.3 and higher are available now at MOGAanywhere.com and in early November at retailers including Best Buy, GameStop, Sprint, Target, and Verizon. Both controllers include support for multiplayer gaming on the same screen, improved ergonomics, improved Bluetooth® radios, seamless support for the growing library of hundreds of MOGA Enhanced and HID-compatible games, MOGA S.M.R.T. Lock™ Technology to secure the user’s phone to their controller, and more. For more information and a complete list of MOGA Enhanced games please visit MOGAanywhere.com. MOGA is the industry leading mobile gaming system. 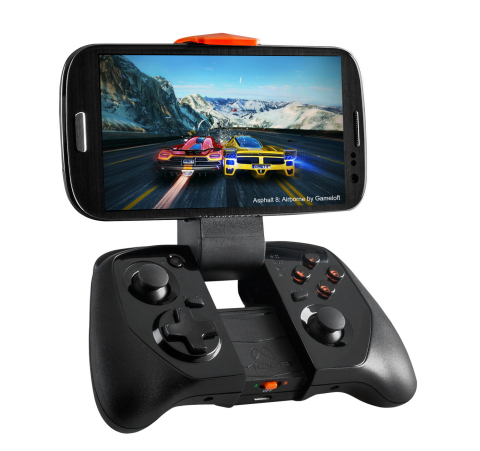 MOGA mobile game controllers offer precision controls, portability, and great games. All MOGA controllers feature dual analog sticks, shoulder buttons, and action buttons to transform smartphones and tablets into precision mobile gaming systems.